Aiseesoft Free MXF Converter 6.5.18 Free Download - Convert MXF files to AVI, MP4, MOV, WMV, HD video and MP3 audio formats. Convert MXF files to AVI, MP4, MOV, WMV, HD video and MP3 audio formats. Aiseesoft Free MXF Converter can help users convert MXF files shoot by Panasonic P2 camcorder, Canon XF camcorder, etc to AVI, MP4, MOV, WMV, HD AVI, HD MP4, HD MOV, HD WMV video and MP3 audio formats for popular video editing software, such as Adobe Premiere, Sony Vegas, Windows Movie Maker, Avid, etc. Also the output files are highly compatible with popular portable devices, like iPad, iPhone, iPod touch, PSP, Android devices, BlackBerry, etc. 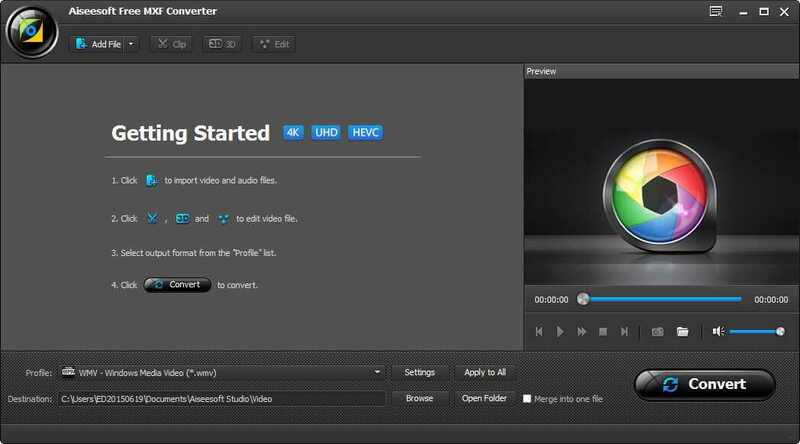 Powerful video converting software can help you convert MXF to MP4, AVI, MOV, WMV, HD videos, MP3. Transcode MXF files to Sony Vegas, Adobe Premiere, Windows Movie Maker, Avid, etc. It allows you to do the multiple conversions simultaneously. It is 100% Free and Clean. And there is no malware, no spyware and no virus. Statement: First, please download the orginal installation package by clicking the download link. Of course you may also download it from the publisher's website. Using Aiseesoft Free MXF Converter crack, key, patch, serial number, registration code, keygen is illegal. The download file hosted at publisher website. We do not provide any download link points to Rapidshare, Hotfile, Depositfiles, Mediafire, Filefactory, etc. or obtained from file sharing programs such as Limewire, Kazaa, Imesh, Ares, BearShare, BitTorrent, WinMX etc. Software piracy is theft. If you like Aiseesoft Free MXF Converter please buy it.